The election is over. The Coalition won, amassing a formidable majority in the House of Representatives. The 44th parliament will welcome one, maybe two parliamentarians of Asian Australian descent, both from the far West. Ian Goodenough predictably won the WA seat of Moore, taking over from Liberal predecessor Dr Mal Washer. Goodenough was born in Singapore, migrated to Australia when he was 9 years old, and comes from mixed English, Portuguese and Chinese stock. He is an accountant, property developer, and has been a local councilor in northern Perth since 1999. He is the first Asian Australian to hold a House of Representatives seat since Michael Johnson left under controversial circumstances in 2010. The big surprise has been the Palmer Uniting Party’s (PUP) Zhenya (Dio) Wang, who last week leapfrogged both the Greens Scott Ludlam and the Australian Sports Party’s Wayne Dropulich, to potentially claim the highly contentious final WA Senate spot. Wang was born in China, migrating to Australia to study civil engineering in Melbourne. He moved to Perth in 2006, and is a mining executive with Australasian Resources Ltd. Based upon an interview with 720 ABC Perth, Wang appears to oppose the carbon and mining taxes, and supports a less conservative refugee policy than the major parties. He also has an interest in promoting the agricultural industry, and in public transport, hospitals and schools. Importantly, his unlikely victory has shifted the Senate balance of power to Palmer’s fledgling party, reinforced by Palmer’s mini-coup in bringing over Senator-elect and motor enthusiast Ricky Muir. After June next year, the Coalition will not be able to pass legislation with the support of the other independents alone. Whether the AEC Senate recount gives the last WA seat to Wang or Ludlam, the Senate dynamics will remain changed. From an Asian Australian perspective, there wasn’t a wave of incoming Asian Coalition members of House of Representatives (MHR), and the success of Goodenough and Wang indicates a gentle shift towards the centre-right. Looking at the key Coalition hopefuls that did not make it, like John Nguyen in Chisholm, the Andrew Nguyens in Fowler and Oxley, David Lin in Rankin, and the infamous Jaymes Diaz in Greenway, many political pundits have already had their say, particularly on the unimpressive Coalition performance in western Sydney. UTS sociologist Andrew Jakubowicz claimed it was because Labor ran a highly effective grassroots campaign. He and others have speculated about the Coalition’s campaign strategy, with the exclusion of ethnic candidates like Nguyen and Diaz from the campaign trail. Others have asked questions tying poor performance to the dubious state of NSW branch membership, and the role of factional warfare between Liberal ‘moderates’ and the ‘hard right’ during preselection. Fundamentalist Christian and factional warlord, David Clarke member of the Legislative Council (MLC), appears again to have been critical. This brings us to the fact that matters of race ‘figured ugly’ throughout the Federal election. On a party political basis, Fowler candidate Andrew Nguyen claimed that the Liberals lacked an ‘ethnic brain’, that they treated ethnic candidates like ‘second-class citizens’, and called attention to the Coalition’s small target strategy claiming, “No one in western Sydney was allowed to talk, it was party policy”. The ramifications of this appear to have damaged at least one Federal career, with Senator Concetta Fierravanti-Wells relegated to the outer ministry. As Sinodinos intimated during the ABC election coverage, it would be good to know more about how Diaz was pre-selected. You would hope this could be a matter of public scrutiny, for the sake of political transparency. Focusing on Sydney, however, does not explain the results for David Lin or John Nguyen. The media controversies that dogged both candidates go some way to explaining the poor outcomes. Nguyen was cornered on grounds of principle. He was roundly criticised for supporting the Coalition’s Stop the Boats dog-whistle, being from a refugee background himself. Lin faced more serious allegations. Media sources exposed him for unsatisfactory professional conduct by Queensland’s Legal Services Commissioner in 2007, and for mishandling over $15,000 of his clients’ money. During the election, it was detailed that he had spent $1million on his campaign; there was a bizarre endorsement by Kevin Rudd’s brother, former lobbyist and Senate candidate Greg Rudd; and there was even allegations of dirty tricks, with allegedly fake Labor propaganda being letter-boxed! The problems appear to be less about Liberals endorsing ethnic faces, and more about the quality of their vetting processes. Party democracy is not the problem. It is the party’s tendency to endorse dodgy ethnic candidates, and to support dodgy racial policies. On the progressive front, the election was to a large extent shadowed by the demise of Julia Gillard’s prime ministership, which we now know says a lot about the leeway commercial media and ordinary voters give to gendered attacks on our parliamentarians. It is about time to admit that this lack of balance and impartiality about who is fit to represent applies in relation to race as well. And it’s not just a matter of introducing quotas as Labor’s Bill Shorten proposed. It is about building the capacity of Australia to be a more inclusive society, a cultural change that has to begin at the grassroots. In the ACT, Greens Senate candidate Simon Sheikh faced unacceptable kinds of public racism, with his campaign signs de-faced to say ‘Arab Proof the Senate’. 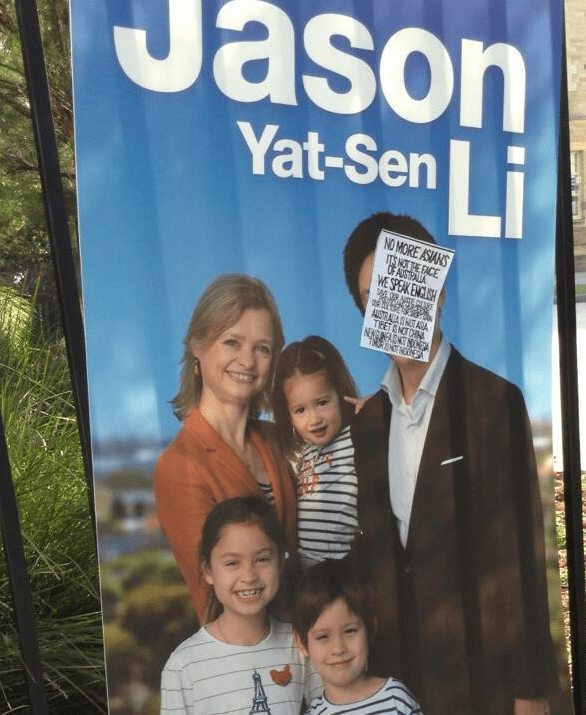 In the electorate of Bennelong, Jason Yatsen Li faced the same tenor of racial vandalism. The dismal state of our national political culture was of course framed by blistering bipartisan attacks on asylum seekers before and during the election, a set of optics so vile that Tony Abbott himself has shrunk away from them since. Minor lights on this issue came almost only from the Greens. Nonetheless, the major party attacks on vulnerable groups, at the periphery of the body politic, are a new historical low point in post-WAP (White Australia Policy) Australia. The non-racist bipartisan policies held by former Hawke and Fraser administrations should be considered little more than fables told by old-timers. Progressive politics suffered heavily losses at this election, with significant falls in the primary vote for both Labor and the Greens. A tentative positive result (which is against-the-grain considering what some are saying about our current system of Senate preferences) is that we saw more Asian Australian candidates, from more parties. The new Senate reinforces the decline of the two party oligarchy, and the tendency for more and more Australians to not identify with them. We can also look to an increasing level of conventional political participation from people at the margins of the Australian political community, ranging from relationships cultivated by the Labor Party in Sydney with ethnic communities and international students, to the role of African Australians in inner-city Melbourne, campaigning for Adam Bandt. Since Labor opened the Australian labour market to global forces in the 1980s, since the numbers of migrant citizens joining the nation have significantly increased (as well as long-term non-citizen residents brought into our economy), we have needed to look at new ways of political inclusion. This assumption was finally understood in a handful of electorates where the progressive vote survived (or even grew). It was understood that disadvantaged and migrant constituents strongly respond to political parties when their voices are heard, and relationships are built. So how will a Conservative government, or a Labor Party in the process of rebuilding itself, respond to this ‘differentiated polity’ outside the election campaign? We will have to wait and see. There are a lot of race and migration issues that will unfold in the next few years, from Operation Sovereign Borders to the Coalition’s version of constitutional recognition for Australia’s First Peoples, to Andrew Bolt’s right to defame Indigenous, ethnic and religious communities legally on air (the repeal of s18C s18D of the Racial Discrimination Act). The Coalition’s legislative agenda will tell us exactly the extent to which Abbott wants to be either a ‘Prime Minister for all Australians’ or a Prime Minister who governs for the noisy, hostile, and most powerful segments within middle Australia.